In 2014, Gregory Clark proposed a ‘simple law of mobility’ suggesting that intergenerational mobility is much lower than previously believed, and relatively uniform across countries. This column tests this law using US and Swedish data. The results show, in contrast to the simple law of mobility, no evidence of a rise in intergenerational persistence and no evidence of uniformity across countries. Researchers have long studied the extent to which inequalities in socioeconomic status persist across generations (for reviews of the literature, see Solon 1999, Björklund and Jäntti 2009, Black and Devereaux 2011). And, despite the US being affectionately referred to as the ‘land of opportunity’, the transmission of (dis)advantage has been shown to be stronger in the US than in most other high-income countries. The Nordic countries are at the other end of the spectrum, with some of the highest rates of intergenerational mobility in the world. That is, until a recent body of highly publicised work using new empirical methods proposed a ‘simple law of mobility’ (e.g. Clark 2014). The simple law suggests that intergenerational persistence is much stronger than previously believed in all countries, and is further uniformly high across (all) vastly different societies and over centuries (Clark 2014). Given the direct contradiction to established results in the existing literature, Clark hypothesises that these previous studies focused on a single ‘noisy’ measure of socioeconomic status, such as income, education, or occupation, which led to downward bias in the estimates; if the information from these measures were combined, estimated persistence would be much higher and in accordance with the ‘simple law’ (Clark 2014, Clark and Cummins 2015). In recent work, we test this proposition about prior studies (Vosters and Nyborn 2017, Vosters 2018). We do not find evidence of a substantial rise in intergenerational persistence when information from multiple measures of socioeconomic status are combined, nor do we find evidence that persistence is uniform across countries. In general, studies of intergenerational mobility regress a child’s socioeconomic status on that of the parents, so the parameter we estimate (ß) reflects intergenerational persistence, and one minus this is a measure of mobility. The research underlying the simple law of mobility uses a novel, but also completely different estimation method based on comparing surname averages of income (or some other status variable) and deducing ß from those averages. Across several different countries and time periods, the persistence estimates based on the chosen surnames tend to be much higher than traditionally estimated, leading to the conclusion that ß is about .75, which implies uniformly low rates of social mobility (Clark 2014). 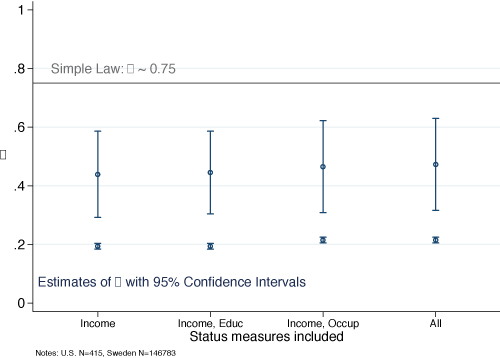 In the mainstream economics literature that uses income as a measure of socioeconomic status, estimated persistence rates have been around 0.4 to 0.6 for the US, and 0.2 to 0.3 for Sweden. Although there is a rich history in the literature regarding measurement error in observed income as a reflection of a longer-term or lifetime income, the argument underlying the simple law is that even if we perfectly observed income (or education, etc. ), it is still only a partial measure of latent (or ‘overall’) social status. This is essentially a standard problem of measurement error in an independent variable, which tends to attenuate estimated regression coefficients towards zero. It is suggested, however, that adding information from other measures, like education and occupation, would substantially decrease the magnitude of this bias (Clark and Cummins 2015). We argue that a methodological approach from Lubotsky and Wittenberg (2006) for combining information from multiple proxies for a single latent variable is ideally suited for this particular scenario (Vosters 2018). The basic idea is that if we believe each measure is essentially the unobserved latent status plus some noise or error – and that these errors are correlated across measures – we can include all of these in an OLS regression, and then add the resulting OLS coefficients optimally using weights. This aggregates the information from these measures in the sense that we obtain the greatest lower bound for (or least-attenuated estimate of) the persistence parameter. To test for evidence of the simple law in the US, Vosters (2018) applies this method to data from the US Panel Study of Income Dynamics, specifically using a sample of fathers and sons very similar to those used in earlier studies about which the controversial claims are being made. Estimating regressions using income alone and then progressively adding other measures of status does not indicate that this aggregation leads to substantially higher estimates of persistence. 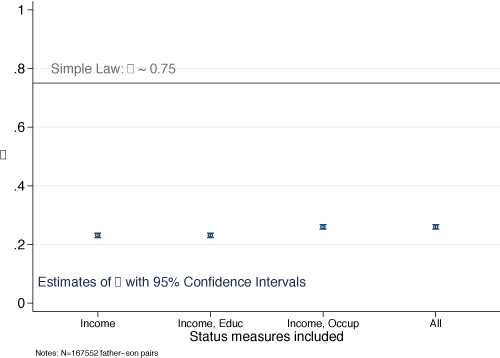 As shown in Figure 1, the estimates relating sons’ status to fathers’ status rise only from 0.44 based on income alone, to a slightly higher 0.47 after also incorporating fathers’ education and occupation – still in line with prior research and far from the 0.75 proposed in the simple law. In Vosters and Nybom (2017), we apply the aggregation to very rich Swedish administrative data, which facilitates more precise estimates, affords more refined measures of income, education, and occupation, and also enables a test of the proclaimed similarity across countries. We find that even after using more detailed status measures for fathers (e.g. longer-term income averages, more detailed education and occupation information), the Swedish estimates of persistence rise only from about 0.23 to 0.26, as shown in Figure 2. These estimates are well below 0.75, and are similar to previous studies for Sweden. We do, however, show that the aggregation method can make a difference in cases where income is indeed a poor proxy of status, such as for females in cohorts for which labour force participationwas lower than in recent times. To facilitate a valid cross-country comparison, we also harmonise the income, education, and occupation measures in the Swedish data to match those in the US data. These give us slightly lower persistence estimates for Sweden, ranging 0.19 to 0.22, which are well below those for the US as shown in Figure 3. Although the US estimates are far less precise given the small sample size, neither the persistence estimates for the US nor those for Sweden increase to 0.75 with the proposed aggregation, and our results confirm that there is substantial variation in intergenerational mobility across countries. In related work, Braun and Stuhler (2018) use data on multiple (more than two) generations rather than multiple status variables to look for evidence of the simple law. They find a higher rate of persistence than implied by traditional methods for Germany, giving some support to the arguments underlying the simple law, but their estimates also remain significantly lower than 0.75. While our studies, along with Braun and Stuhler (2018), address what can be done with traditional intergenerational datasets, Güell et al. (2015) propose a different surname-based method, and do not find results consistent with thesimple law.The novelty of surname-based methods is that they allow the use of datasets without explicit intergenerational links. However, as Güell et al. (2015) explain, the grouped estimator underlying the surname-average approach will be biased upward if the chosen surnames are correlated with measures of socioeconomic status. The large body of existing studies, although susceptible to biases due to various data issues, has a good grasp on general pictures of intergenerational mobility in many Western societies. We did not find evidence in support of a ‘simple law of mobility’ governing intergenerational transmission, but such a proposal did prompt us to use an innovative method. In general, the literature is taking several new and exciting directions as data sources grow in quality and quantity. Whether using new methods, looking at mechanisms, adding generations, or simply exploring new datasets for countries not yet studied, there is a lot we have yet to learn about the extent to which inequality is passed on across generations. Björklund, A and M Jäntti (2009), “Intergenerational income mobility and the role of family background,” in W Salverda, B Nolan and T Smeeding (eds), Oxford Handbook of Economic Inequality, Oxford University Press: 491–521. Black, S E and P J Devereux (2011), “Recent developments in intergenerational mobility,” in O Ashenfelter and D Card (eds), Handbook of Labor Economics 4, Elsevier: 1487–1541. Braun, S and J Stuhler (2018), “The transmission of inequality across multiple generations: testing recent theories with evidence from Germany,” Economic Journal 128(609): 576–611. Clark, G (2014), The Son Also Rises: Surnames and the History of Social Mobility, Princeton University Press. Clark, G and N Cummins (2015), “Intergenerational wealth mobility in England, 1858–2012: surnames and social mobility,” Economic Journal 125(582): 61–85. Güell, M, J V Rodríguez Mora and C Telmer (2015), “The informational content of surnames, the evolution of intergenerational mobility and assortative mating,” The Review of Economic Studies 82(2): 693–735. Lubotsky, D and M Wittenberg (2006), “Interpretation of regressions with multiple proxies,” Review of Economics and Statistics 88(3): 549–62. Solon, G (1999), “Intergenerational mobility in the labor market,” in O Ashenfelter and D Card (eds), Handbook of Labor Economics 3A North-Holland: 1761–800. Vosters, K (2018), “Is the Simple Law of Mobility really a law? Testing Clark’s hypothesis,” Economic Journal 128: F404–F421. Vosters, K and M Nybom (2017), “Intergenerational persistence in latent socioeconomic status: Evidence from Sweden and the United States,” Journal of Labor Economics 35(3): 869–901.